Everyone has an opinion about fruitcake. I’m in the “don’t care for it” camp. 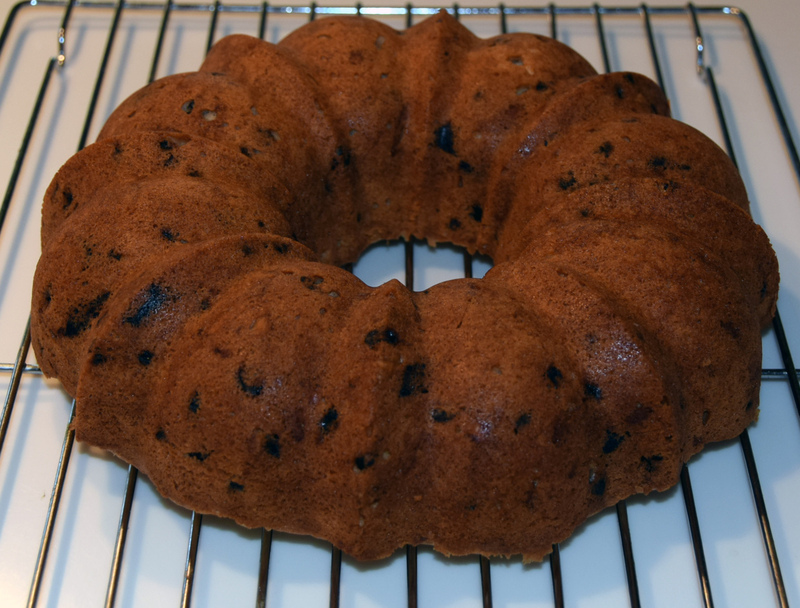 My version of fruitcake is not too sweet and not too fruity. I make this every year. Combine the currants, almonds and chocolate in a bowl and toss with the rum. Let sit for at least one hour. If I have time I let it soak overnight. Preheat oven t o 350 degrees. Butter and flour a bundt pan. Note that this recipe will only fill the pan half way. Because of that I like to use a “traditional” style bundt pan since some of the newer fancier pans don’t look as nice when partially filled. Using the whisk attachment and a mixer, beat the egg whites on high speed until soft peaks form. Gradually add the sugar until shiny and stiff. Transfer the whites to another bowl (you don’t need to clean your mixer bowl, just scrape it as best you can). 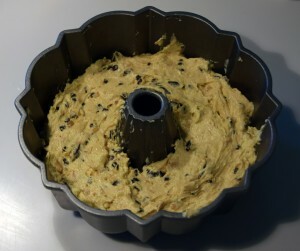 Using the beater attachment and a mixer, beat the butter and almond paste until fluffy (about 2 minutes). Gradually beat in the eggs yolks, vanilla and orange zest. Stir 2 tablespoons of the flour in with the currants, chocolate and nut mixture. Fold the egg whites into the butter mixture. Stir in the salt and baking powder. Gradually stir in the flour. 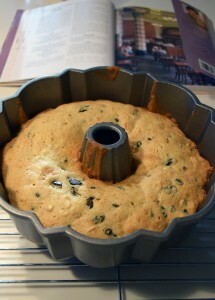 Incorporate the currant, chocolate and nut mixture.Pour the batter into the bundt pan and spread evenly. Reduce oven temperature to 325. Bake for 35 minutes or until brown and a toothpick comes out clean. Cool for 10 minutes then turn out cake onto a cooling rack. Cool completely. Sprinkle with powdered sugar or drizzle with melted chocolate if desired. Adapted from one of my favorite baking books – Kaffeehaus: Exquisite Desserts from the Classic Cafes of Vienna, Budapest, and Prague by Rick Rodgers. 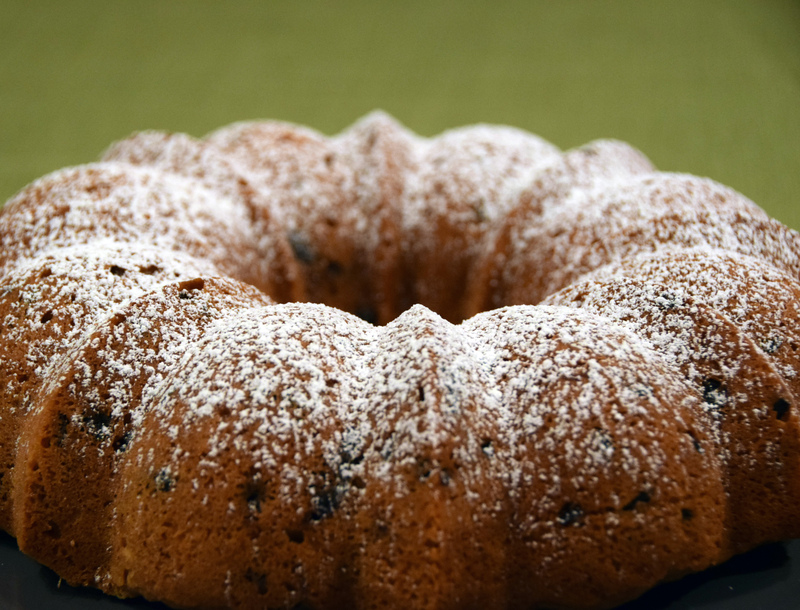 This entry was posted in Recipes and tagged almond, almond paste, Cake, chocolate, currants, fruitcake, holiday baking, recipe, rum. Bookmark the permalink.